Justin & Lindsay Mitchell arrived in February, settling just “up the street” from us about 20 minutes away. Yes, there’s been some learning curves in food, shopping, hospital (Lindsay will have a baby in August), transport and financial services, also the tiny space in Tokyo, mail, garbage sorting (an ongoing mystery even for me - see lavermansinjapan.org/gomi) and so on. And the Japanese language will be a humbling adventure for years. But they’re adapting great. 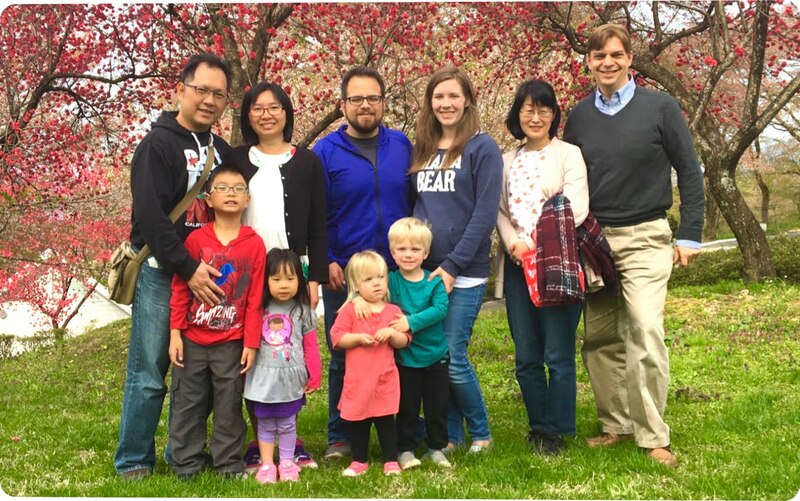 Then during April, we hosted Gary & Jennifer Chang and kids here in Kawasaki for a two-week “vision trip.” They’re raising support and coming to Japan through WorldVenture in 2018 to join hands with us on this new team. Bit by bit the team is forming, but we need others, too. 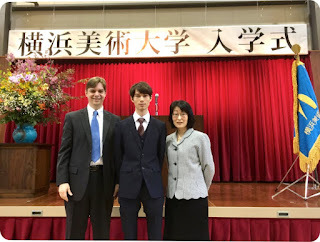 Specifically, a full-time Japanese worker, an English speaker for TESL outreach (see lavermansinjapan.org/tesl), and more missionaries with expertise in music, media, youth, or kids ministry. Protestant Christianity in Japan began just south of us in Yokohama bay in the 1860’s. But the number of churches has never kept up with the density of people and need. New churches are needed for the 5.2+ million in Kawasaki-Yokohama, 99% without Christ. Would you pray with us for the formation of this “mission possible” team for Japan? No fooling. April 1st was a big day in the Laverman home. Justen started his new adventure: college entrance in Japan (the school year starts from April here). We moved to Japan when he was two and now he’s twenty. Those years got him fluid in the language (no thanks to his dad’s messy Japanese examples) and prepared to build a life in this country He started at “Hamabi”: YokoHama Bijustu Daigaku (College of Design), commuting daily by train from our house about 30 minutes away. Justen wants to serve God through his talent in design. Those of you who have seen his artwork know that he shows great potential. We look forward to seeing how the Lord will blend all these third-culture kid experiences, design skills and languages together for His glory through Justen in the future. The first line was April 27 at Musashi- Kosugi station. 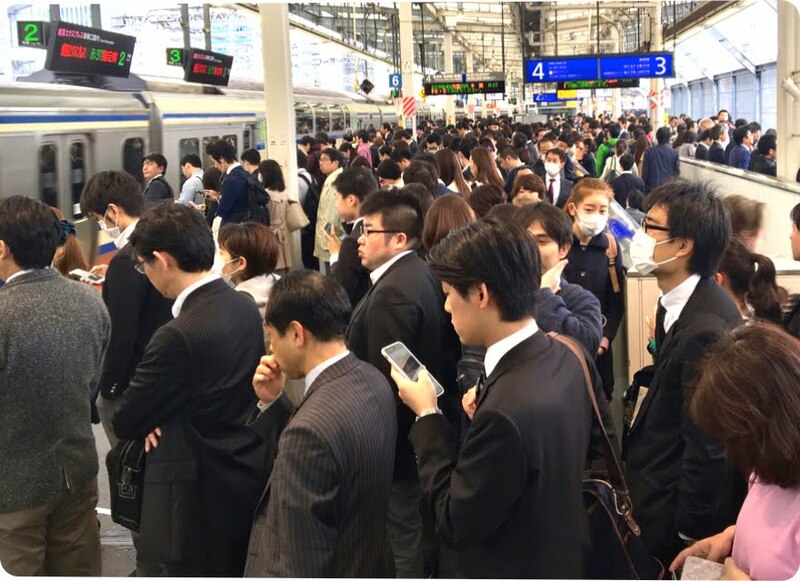 I was wrestling to get the Chang family (see front) and their suitcases to the spot on the platform for the airport express, but the morning commuters were as thick as it gets. We were only able to move down the platform a few yards at a time after each train pulled out of the station, and before the next arrived. The video link above might help you understand. A few days earlier I had viewed this station and Musashi-Kosugi area (our location for next church plant as God provides), with a visiting supporter from the 62nd floor of one of the many hi-rise apartments. Now I know where all those residents go in the morning. There needs to be an evangelical church witness for them! The second line was May 4 at a shrine in Kamakura. Hundreds had rented a basket from the shrine to insert coins or bills to dip into the magic spring that multiplies prosperity. I took a video (above link) to give you an idea. Japan doesn’t need more prosperity. They need Christ! Superstitions can’t give what He offers freely. Pray for Musashi-Kosugi. Pray that God will lead us to a person of peace through which to start a church in this neighborhood soon. Pray for them to put their affections not on the superstitions of this world, but on the work of Jesus Christ. A friend recently forwarded this link to me which gives you an inside look at a sushi restaurant. Many popular "kaiten sushi" shops have a circular conveyor belt where plates are placed that revolve around in front of the seated customers. 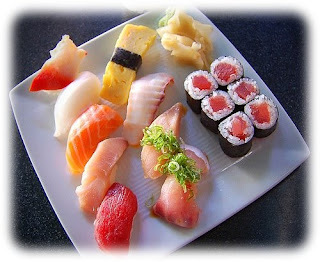 Customers choose the plates with sushi items that look appealing to them. This short video was taken by a foreign customer who placed a running video camera on the conveyor belt. The clip makes for an interesting few minutes of people watching, and an inside peek at the kitchen at the heart of the sushi shop. Enjoy! Makoto first noticed signs of panic attacks when he was in the middle of an exam. The tension forced him to repeatedly make trips to the toilet. He couldn't concentrate at all. For the next exam, he made a point of arriving two hours early to make sure he got a seat near the door. That failed to calm him and he found himself in the same situation all five exams he took. After graduating from university, the company he worked for was changing over to a new system. Makoto threw himself into the extra work involved. He worked well into the night, missing the last train home. He would nap at a nearby sauna and be back in the office first thing in the morning. This went on for months. Makoto and many others in Japan suffer from a condition known as panic disorder (PD). Panic engulfs them. How many people are affected? Current estimates suggest up to 4 percent of the Japanese population. 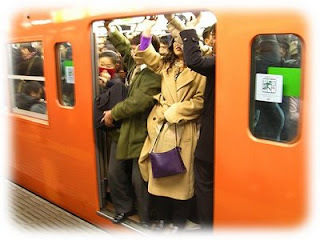 What is the solution for panicked Japanese people? The power of the Gospel. "God has not given us a spirit of fear, but of power and of love and of a sound mind." (2 Timothy 1:7). “That house is a lost cause!” I thought, and hesitated in putting a church flyer in its mailbox. The home was literally in the shadow of a powerful Buddhist temple next door. Who could have known that a couple weeks later a woman would walk into our worship service and say, “I'd been thinking about Christianity when I received a flyer from this church.” Yes, as we'd later find out, she lived in that very house! Coincidence? No! God? Yes! Mrs. Nakamura examined Christianity with us seriously, but seemed to be troubled by things. 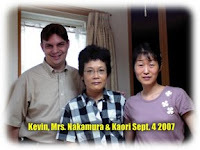 Then one day a breakthrough: “Kevin, I've been trying to understand Christ with just my head, but I know now that I need to accept Him with my heart...by faith.” From the house I assumed was lost to the clutches of Buddhism, God had been calling His child, Mrs. Nakamura for a long time. In our living room September 2007, He welcomed her to himself as she placed her faith in Jesus! Today Mrs. N. accepted Christ in our dining room. PTL! After I explained the Gospel message to her again (she had come to our home in August as well), she said she was ready to make a decision. With misty eyes she repeated the sinner's prayer after me. Kaori sitting next to me also shed a few tears...of joy. It has been a long journey for her in her life to come to this point. I will share a little more of this story in a later post. Tomorrow is our Youth Camp (in the middle of a typhoon it seems). I still have quite a bit of preparation for that and Sunday, so I will write more later.